Do dumbbell bench press with elbows along the body work, the anterior bundles of the deltoid and, a little bit, its middle portion to avoid an excessive friction at the front of the shoulders. Do it regularly, it allows you to keep shoulders voluminious and tonic in spite of a local pathology. And it can use as a rehabilitation movement after a tear of pectoralis major muscle. Keep elbows along the body reduces stretching of pectoral major muscle limiting the risk of tearing of the injured area. It’s important to take into account the individual differences in morphology when you’re training shoulders with back press. Arms lenght and especially forearms, plays a fundamental role in the execution of the exercice. People with proportionately long forearms will descend their elbows much lower than those with proportionately short forearms. This excessive elbow descent has the effect of streching the deltoid strongly, placing it in an unfavorable position that doesn’t allow the muscle to recruit the maximum amount of fiber to start the push powerfully. 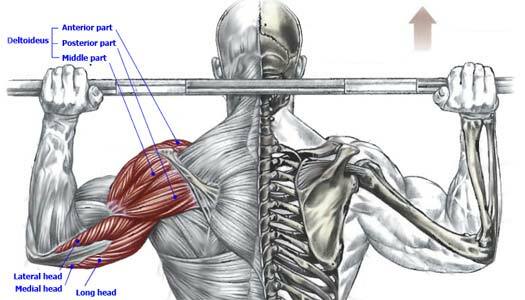 Clavicles width has a influence on the possibility of correctly lowering the barbell behind the neck. Short clavicles invariably bring the two shoulder blades towards the vertebral axis. It follows that during the back press, when the two shoulder blades tilt towards the inside of the back, their displacement is substantially reduced by the compression of the trapezius and rhomboid muscle which fill the middle of the back, which limits at the same time the possibility of descendent correctly elbows to well feel deltoids work. 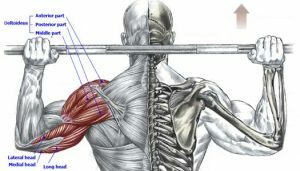 In addition, it’s important to note that more you have big muscles in the center of the back, the less the shoulder blades will be able to get closer and the lower the barbell behind the neck will be limited. Note : Indivuduals with long forearms and narrow clavicles should have an interest in avoiding the back press to properly work deltoids. Too much space between the glenohumeral joint and the acromio caraoidal osteo ligamentary vault can lead to excessive friction when the humerus is raised in external rotation. With time, risk to damage, even tear, the supra-spinous tendon. 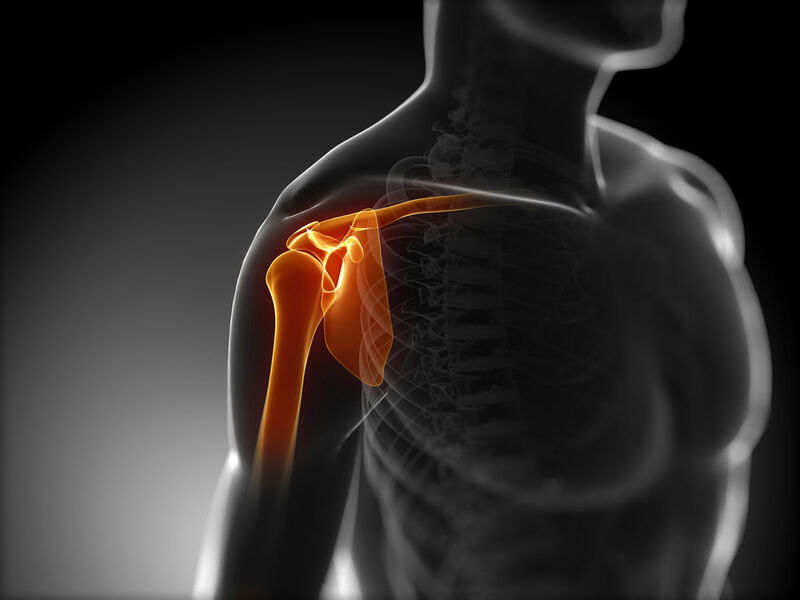 With back press, it’s therefore important with the slightest sensation of discomfort in shoulders, accompanied by pain, to change movement in order to avoid a degenerative rotator cuff’s tendinitis. A too small space between the gleohumeral joint and the acromio caraoidal osteo ligamentary vault can cause, during the arms elevation – when the humerus is carried this time in internal rotation (as with dumbbell lateral raise), excessive rubbing which may damage the infraspinatus tendon.